The salutary action of nitrates in the treatment of angina pectoris has been recognized for over a century since the classic reports of Brunton (1867) and Murrell (1879). 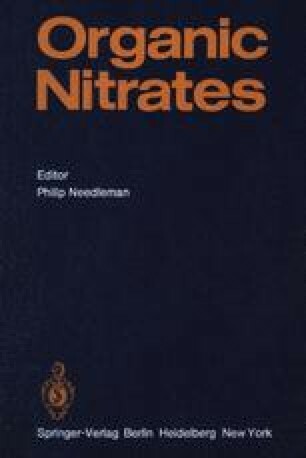 The historical background of nitrates is reviewed in detail in another chapter of this book. Despite the frequent, daily administration to patients with coronary disease and many investigations of these drugs in patients and experimental animals, their mechanism of action is still incompletely understood. This is in part because nitrates affect systemic vessels and the heart as well as coronary vessels. Mindful of the manifold effects of nitroglycerin which include peripheral vascular and myocardial factors, all interacting simultaneously with the direct coronary vascular effects of the drug in the control of the coronary circulation, it is perhaps understandable that a unified concept regarding the mechanism of action of nitrates has not evolved.